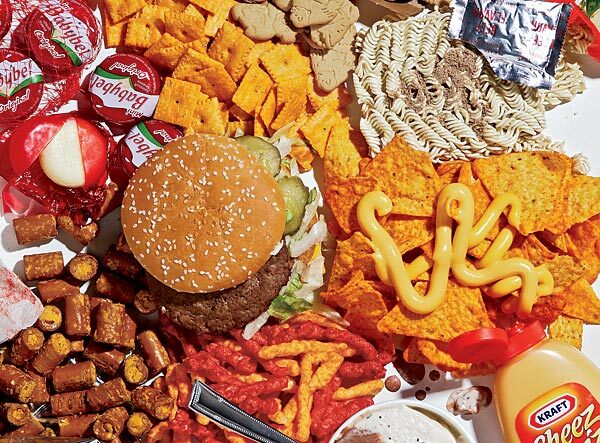 A vicious circle – Addictive food. A couple of days ago we posted a very interesting video called ¨The Science of Addictive Food¨ made by CBCT The National on our Facebook page. It discussed the way fast food is being produced or actually engineered to be more addictive. We keep on discussing many reasons for the growth of obesity among many western cultures. Different media are alerting that obesity ratios are higher than ever, that there is a growing number of obese people in France, which before was known for its healthy diet. Despite all these alerts and many campaigns about healthy food, fast food and processed food consumption is growing, which is the main driver for obesity related problems. The video I mentioned above inspired me to write about this problem. It explains how the big food companies such as Unilever, Kelloggs, PepsiCo, Nestle, Coca-Cola or Kraft, are producing their food. Their food production starts not with farmers working on fields but with highly experienced engineers working in laboratories. Some neurosurgeons work on finding the relation between texture of a given food and the pleasure it gives to us in the brain. There’s more. There are studies being conducted to find a way to confuse our brain. Everybody knows Cheetos and their tendency to melt in our mouth. Actually this phenomenon has a scientific name: Vanishing Calories Density. It is a hypothesis created by Dr. Robert Hyde. Its principle is to send a message to our brain saying that the caloric intake is less than actually consumed. This phenomenon provokes us to eat more of a given produce. Another example of what kind of research the big food companies are spending a major part of their profits is the texture of the food we eat. Did you know that a traditional yogurt density and percentage of fruits put in it is scientifically calculated? 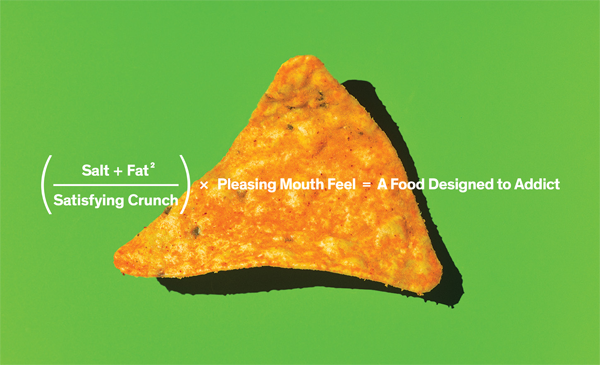 Food engineers are preparing a special formula so that our taste receptors situated on our tongue can immediately send a message to our brain about the pleasure we are experiencing. Processed food gives us pleasure, because of the presence of one or more of these three ingredients: salt, sugar and fat. Salt enhances flavors, sugar gives us pleasure (some sugars are even addictive) and fat helps to us to have a great feeling of smoothness while eating. If you try to eat Ritz crackers, which have not been processed with salt, you would probably not eat them because they’d taste like sand cookies. In my opinion the conclusion is quite easy. Even though some of us are aware of these issues, processed food is too tempting so everybody wants to grab an occasional Cheeto or a Ritz cracker with some cheese. In my next post I will discuss the way processed food is being commercialized and what are the main messages of companies such as Coca-Cola. However, we cannot blame everything on the food system, which is actually mainly based on us – consumers. There is a huge precipice between what we know, what we are aware of and what are we doing in order to improve ours or our kids diets. In Poland, the Gdansk Medical School has carried out a research stating, that 10% of 6 year-old kids (pre-school age) are overweight. If we analyze the same data for 9-10 year-old kids (after 2 to 3 years of school) the percentage of overweight children rises to 18%. An easy answer to this problem would be: It is because in school stores you have so many processed foods. Yes, correct. However, kids do not possess the possibility of earning money (at least in developed countries), so who is responsible for the fact that some 9 years old come to school with $5 bills, which mostly get spent on sweets and chips. Kids at this age start to make their own decisions that make them feel independent. A lot of parents say that kids do not like to eat fruits or vegetables and that there is nothing they can do about it. This is the moment when parents should look at their food preferences. Children usually adopt food preferences that they’re exposed to at home. Recently I heard a story about a 5 year-old girl brought up in a vegetarian house. She came to a party where there were many delicious kinds of hams, pastry and other elaborated dishes. She would sneak into the kitchen and pick up raw vegetables and fruits to snack on. Who would think that it is possible? If you really are fed up with how our food system looks like, please start looking at your own food preferences now, because it is not too late to make a change. Unfortunately, if you don´t do something you just become another victim of the big vicious cycle of the food system. Posted on June 26, 2013 June 26, 2013 by saynotofoodwastePosted in BlogTagged calories, carbs, food, food security, gastronomy.